Justice Abhay Oka of the Bombay high court asked the Maharashtra government this probing question last week while hearing a petition moved by activist Sanjay Lakhe-Patil to declare a drought in the state. According to Patil, the Maharashtra government should have declared drought by the last week of August, but did not do so. On October 31, the Devendra Fadnavis-led government declared in the high court that 42 per cent of the state was facing a drought. 'You cannot declare a drought on the whims and fancies of any minister or officer,' Patil tells Rediff.com's Syed Firdaus Ashraf. Of 355 Maharashtra talukas, 112 have been declared drought-affected. Why did the government do so so late when it was evident the state is facing a drought? I filed the petition in the court under the Disaster Management Act. I had requested in my petition that the Maharashtra government must declare a drought by August last week after seeing the ground situation. The situation on the ground was bad, but the state government was not doing anything. Moreover, the state doesn't have the resources to tackle a drought. Why did you insist on declaring a drought in August? What is the significance? As per the drought manual 2016, if the situation warranted, then the government must consider the month of August to declare a drought. This is written in the drought manual. Who am I to tell them to declare a drought in the month of August? I am only talking of the government manual on drought which was published in 2016. What was the situation on the ground in August? The basic indicator (for a drought) is a dry spell. This year there was a dry spell in Maharashtra. When a dry spell exists, then there will be no humidity and no crop vegetation. These are basic indicators to declare a drought. You cannot declare a drought on the whims and fancies of any minister or officer. There are mandatory indicators for declaring a drought in the 2016 manual, but the Maharashtra government failed (to consider it). The government was sleeping and did not declare a drought early. The government has no mandatory mechanisms to declare a drought or hold mandatory meetings which they must conduct. Nothing has happened on the ground yet to solve this problem. Did you meet any minister or official to alert them about the drought situation? It is the mandatory duty of the state to function on such issues. They are aware of every provision on what is a drought, so is it not their duty to declare a drought? Neither the chief minister of Maharashtra nor the chief secretary or for that matter any collector knows about the Manual for Drought Management 2016 which is mandatory (to declare a drought). The disaster management unit of the Government of India told the Maharashtra government categorically that if they do not follow the gist of their manual, they will not give a single penny to the state. When that is the law, the government must follow the law. But they are not following it. The Maharashtra government has failed totally to assess the drought, to monitor and declare it and to erect the mechanism for (handling) it. There are four conditions for a drought. Dry spell is the first indication. The drought manual says that when there is a dry spell for the first 3 or 4 weeks (during the monsoon season), then you must press the first trigger button. The second indication is the level of the ground water. The third indication is the vegetation of crop and the fourth is the humidity in the atmosphere. When a dry spell is going on, then automatically there will be no humidity and no vegetation, so the number two button has to be pressed. I believe the state's water reservoirs will have only 26 per cent water left in November, whereas last year the reservoirs had 78 per cent water at this time. In my region of Marathwada and Vidarbha there are dams which are dry. There is no water in hundreds of dams across Maharashtra which are small and medium in size. What about Chief Minister Devendra Fadnavis's flagship programme, Jalyukt Shivar in which Aamir Khan was involved? Aamir Khan is a celebrity. He is doing his job as an actor, which he is being told to do by his director. The director is the government of Maharashtra. Dialogues and music too are given by the government of Maharashtra. Fadnavis claims the Jalyukt Shivar programme is a success. Jalyukt Shivar of Aamir Khan and the Maharashtra government has failed. It is a totally failed programme. It is an unscientific and bankrupt programme. I am not blaming Aamir Khan as he is only the actor, but the director and dialogue writer (the Maharashtra government) are playing with nature. 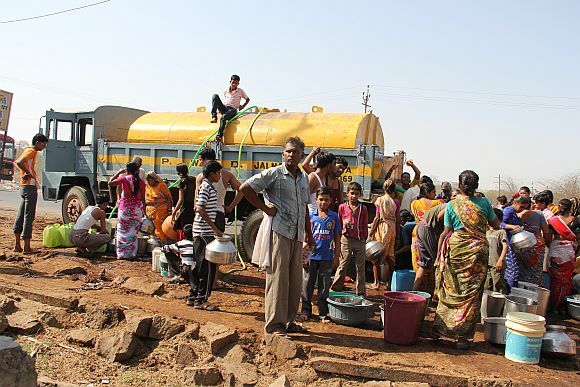 On the ground there are tankers going around the whole of Maharashtra as there is no water. That is the true situation on the ground. There is no water in ponds and no rains. How will farmers do farming? There was a dry spell for 11 weeks and more (during the monsoon). Drought seems to be a recurrent phenomenon in Maharashtra. How can a progressive, developed state like Maharashtra overcome this dependence on the monsoon and become drought-free? What needs to be done? You can call Mumbai and the Mumbai metropolitan region progressive, but the situation is bad in rural Maharashtra. There is total bankruptcy of policy. If they want to solve this problem then they must check out how (then chief minister) Vasantrao Naik tackled the drought situation in 1972. They must do the same thing. But instead of doing ground work, they are sitting and monitoring drought through Mantralaya (the administrative headquarters of the state government in Mumbai) and trying to solve the problem with actors like Aamir Khan.